Mini diced elbow macaroni, in a rich, satiny blend of Gruyere, Monterey Jack and cheddar cheese fresh hand cut chives. From frozen bake in a pre-heated 350ºF convection oven for 6-8 minutes or until done or deep fry at 350ºF for 3-5 minutes or until done. 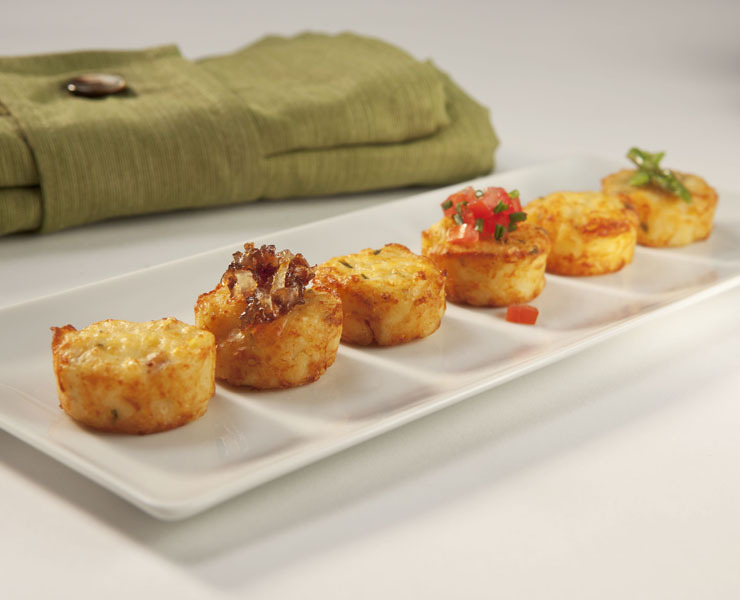 The warm, rich, and comfort flavors of macaroni and cheese, in a bite size shape; Kabobs’ Mac N’ Cheese Melts provides chefs with a unique serving solution for this classic side dish. Focusing on the classic key components of elbow macaroni and a velvety cheese blend with a slight upscale twist with the addition of fresh chives, Kabobs’ Mac N’ Cheese Melts focus on color and particle definition versus the several competing items of a brown breadcrumb ball. The Mac N’ Cheese Melt is versatile in preparation, baked or deep fried, and presentation, as a stand-alone hors d’oeuvre or a component item to a unique culinary masterpiece. Great item for a diverse function, young to old clientele. Can be dressed up for an upscale event, or great for a small gathering of friends. Shredded Russet potatoes, tossed with diced onions, egg, crushed sea salt and pepper, hand formed into unique rustic cakes. Perfect plain or decorated with your favorite accompaniments.